#5 - Gas Boom Goes Bust The Oil Drum #3 - Is Shale Oil Production from Bakken Headed for a Run with “The Red Queen”? The Oil Drum staff wishes Happy Holidays to all in our readership community. We are on a brief hiatus during this period, and will be back with our regular publications early in the new year. In the meantime, we present the top ten of best read Oil Drum posts in 2012. The seventh in this series is a post by JoulesBurn on the North Sea Elgin gas leak which took the news headlines in March 2012. The leak was successfully plugged May 15, 2012, and a permanent plug was put in place in September. A crisis situation has developed at a gas and condensate production platform in the Elgin field in the North Sea. Gas is leaking out of a well near a offshore platform at a rate of approximately 2 kilograms per second (12 MMCF/day if gas), and a large sheen (assumed to be condensate) has been observed on the water. 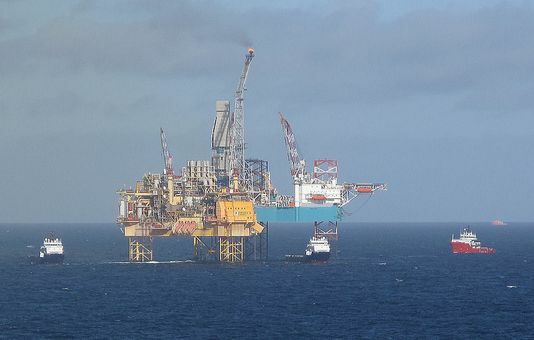 All workers on Total's Elgin PUQ (production-utilities-quarters) Platform plus those on the Rowan Viking drilling rig, which had been working next to it, have been evacuated. 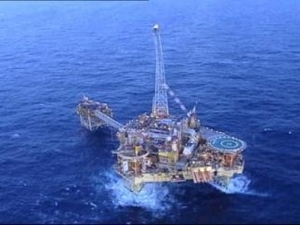 On Monday, workers on a platform and drilling rig at the Shell-operated Shearwater field (4 miles / 6.4 km away) were also evacuated. There is currently a two-mile vessel exclusion zone around the site and a no-fly zone. As current winds are light, the most immediate concern is the potential for explosion both at the PUQ and elsewhere. While it is possible that the leak rate will lessen over time, the Rowan Gorilla V jack-up drilling rig is being provisioned by Total for a possible relief well that could take months to drill. This phase of development is aimed at producing estimated reserves of 85 million barrels of oil equivalent, and will consist of drilling three wells and installing a new platform tied-back to the Elgin/Franklin facilities. The map below shows the location of the fields and the platforms within. Rowan Viking relative to the Elgin PUQ platform. Hainsworth said the problems had occurred during operations to plug and abandon the field’s G4 well. “On Sunday there was quite a sudden rise in pressure and they were finding it difficult to bleed off this rise in pressure,” he said. Hainsworth said that gas is being released on the Elgin wellhead platform at low pressure – about five bar - and that it is coming from a non-producing reservoir above the Elgin formation. The exact cause of the leak has still to be confirmed but Mr Hainsworth said workers at Elgin on Sunday had reported "a spray of liquid followed by a gas release" from a well casing. The well had ceased production a year ago when it was plugged at its reservoir source, 6km below ground. Workers spotted changes to the pressure in its outer casing weeks ago and had been in the process of pumping in heavy mud to "kill" the casing on Sunday. Gas is thought to be entering the casing from another, non-producing reservoir 4km underground, Mr Hainsworth said. Total did not yet know the capacity of this reservoir but in a "dream" scenario it could simply "run itself out". "Engineers have told me that it is almost certain that gas is leaking directly from the reservoir through the pipe casing." The Elgin 22/30c-G4 well was the first development well drilled there. A paper in SPE Drilling and Completion, Field Hydraulic Tests Improve HPHT Drilling Safety and Performance discusses the drilling of this well, specifically on some testing that was conducted above the HT/HP regime (but at greater depths than suggested by Mr. Hainsworth's assessment above of where the gas is coming from). One problematic zone (the Kimmeridge clays) is situated at a vertical depth between 5130 and 5370 m. The problem of the Kimmeridge clays is the uncertainty on the native pore pressure gradient (between 2150 and 2200 kg/m 3), and the possibility of a ballooning effect. According to this source, the well was producing 20,000 barrels of oil equivalent per day and gas at a rate of 2.6 million standard cubic meters per day in 2008. "The well in question had caused Total some problems for some considerable time ... a decision was taken weeks ago to try to kill the well, but then an incident began to develop over the weekend," he said. The paper discusses infill drilling in the Elgin and Franklin fields. After over 15 years of production, these fields are rather pressure depleted (over 800 bar! ), which causes sand infiltration problems and liner deformation due to compaction of the sandstone reservoir. It is possible that well G4 had several problems and they eventually gave up on it. 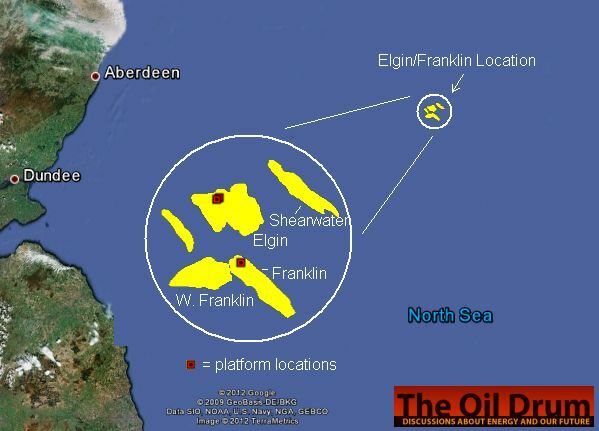 Peak production capacity for the Elgin/Franklin field is 280,000 barrels of oil equivalent per day (around 7% of UK production), 175,000 barrels per day of condensates and 15.5 million cubic metres of gas per day (mcm/d), according to Total. The Elgin-Franklin fields produced a daily average of 61,386 barrels of condensate in November, according to the most recent government data. Elgin/Franklin: What Could Have Been Done Differently? 1 kg/sec (reported by several sources) is a very high leak rate from a formation they drilled through to get to the one they were going to produce. In any case, if the report is true, how was this estimate made? BBC has reported that the flare is still burning high above the platform. If the wells have been shut off, why is this? So, given that methane is a much stronger greenhouse gas than CO2, does this leak eliminate all the benefit derived from using methane rather than coal for electrical generation? Perhaps we should look more toward Liquid Fluoride Thorium Reactors (LFTRs, pronounced "lifters") for energy cheaper than coal. And there would be no GHGs either! No greenhouse gases? It sounds like a miracle. Yes, let's all build these miracle machines and the Earth shall be saved. I suspect you are trying to be facetious but none-the-less you were correct, LFTRs are pretty much miracle machines and we really should start building them ASAP. You can find out more at http://energyfromthorium.com/ . This is actually off-topic in this thread and better discussed in a Drumbeat thread. There's a coda to the Elgin story that might interest Oildrum readers, presented at the American Geophysical Union in San Francisco. It's accessible by searching the AGU Fall Meeting program (which incidentally also has interesting NOAA findings on gas leaks in Utah and Colorado). Aircraft measurement and air sampling have been used to quantify the source and magnitude of the North Sea Total Elgin wellhead platform gas leak in March/April 2012. Isotopic techniques were used to characterise the geological source formation from which the gas came. Initially on 30 March 2012 the leak was in the range 1.6 – 0.7 kg s-1, reducing to less than half that rate by 3 April 2012. Keeling plot analysis of methane in air samples showed that the gas had δ13CCH4 -43‰, implying that the gas source was not the main high-pressure high-temperature Elgin gas field (5.5 km deep, at 190oC) but more probably the overlying Hod Formation. The evidence in the air plume for release of very volatile NMHCs confirmed media reports that the gas leak was on the production platform, above the sea level. This contrasts with the early situation in the BP Deepwater Horizon event, where release was underwater and volatile NMHC species were taken up in the water column. Non-methane hydrocarbons (NMHC) and other volatile organic compounds in the plumes were determined from flask samples by offline analysis. NMHC content was dominated by light alkanes ranging from >20 ppb ethane to <1 ppb benzene and <0.1 ppb higher monoaromatics. The methodology developed in this work is widely applicable to future emissions of environmental concern in circumstances where direct access is difficult or dangerous, and permits unbiased regulatory assessment of potential impact, independent of the emitting party. The above came from one of Total's early press releases. As you can see (if you squint real hard) it does show the gas emanating from the neighborhood of the HOD formation (first red 90° arrow). Of course above that point every time the casing size increases the 'pretty little red arrows' show the path of the gas makes a pair of upward and outward ninety degree turns--except for the migration from annulus 'C' to annulus 'D' which may imply some sort of magical route between in that case?-). In other words the diagram shows multiple annulus seal failures thousands of feet apart. When I first posted this diagram 'toolpush' or some other commentor here with technical expertise in the field said not to make too much of the little drawing. It's been a while since the leak, are there any better explanations describing the path of the gas from the HOD to the drill rig deck out there now? The Elgin leak did point up just how tough an environment we are drilling into trying to reach more FF, we've fresh news on that from up my way. The farther out we reach the more difficult the task. I doubt Shell was enthused about towing it's arctic ocean drill rig, Kulluq, across the Gulf of Alaska in winter, but shipyards with the capability to work on such rigs are far far to the south...only so much time between seasons...well the extreme surfers on Oahu and Kauai's north shores will be liking this storm anyway.